For most municipalities, Energy Conservation and Energy Demand Management planning begin with multi-use recreational facilities. These critical community centers are often large, complex buildings that hold varying combinations of gymnasiums, public spaces and meeting rooms, arenas, fitness centers and swimming pools. These facilities are open more than 12 hours a day, seven days a week. While they have significant energy and maintenance requirements, multi-use recreational facilities also offer the greatest potential for cost savings and opportunities for energy conservation. Many energy efficient measures can be implemented for no or low cost or will pay for themselves within a short time period. Having more energy efficient facilities can help reduce budget overages and manage costs more effectively. Global energy prices are rising as demand overtakes supply. By looking for ways to conserve energy, limit reliance on fossil fuels and manage harmful emissions, municipalities can gain an operational advantage should energy costs rise, or stricter green policies be put in place. Managing the environmental impact associated with municipal facilities demonstrates a commitment to sustainability and a greener future for the community. Facility Energy Conservation and Energy Demand Management require facility managers or administrators to establish a baseline of energy use and monitor how different maintenance activities, facility refurbishments, other operational changes and external factors, like weather, impact energy consumption. A standard ice arena typically has an energy use of around 1,500,000 kWh/year. The most energy efficient arenas use about 800,000 kWh/year, whereas the least energy efficient arenas can consume 2,400,000 kWh/year. This is a wide range that highlights the myriad opportunities for savings that many municipalities could achieve with a few simple updates to the equipment and maintenance processes used in ice rink operations. Ice making is one area that can have an impact on both energy costs and the overall air quality of an arena facility. Operations managers should look for ice making equipment that produces clear, resilient ice without emitting harmful gases or increasing energy costs. The JJE De-OX Ice Making System is a complete water treatment system for all artificial ice rinks that does not use chemicals and requires less energy to build and maintain the rink surface. The De-OX system moves water through a patented twin membrane vacuum that removes all oxygen from the water prior to filling the ice resurfacer and ice application. This allows ice to be built faster by using lower water temperatures, thereby reducing energy costs, and creating a stronger bond than any other ice making technology, all while reducing snow development and preventing ice dehydration. To optimize the results of an environmentally-friendly ice making system, it is key that the ice resurfacer also be in good working order. The lifespan of an ice resurfacer is largely determined by number of uses and strain on the motor. 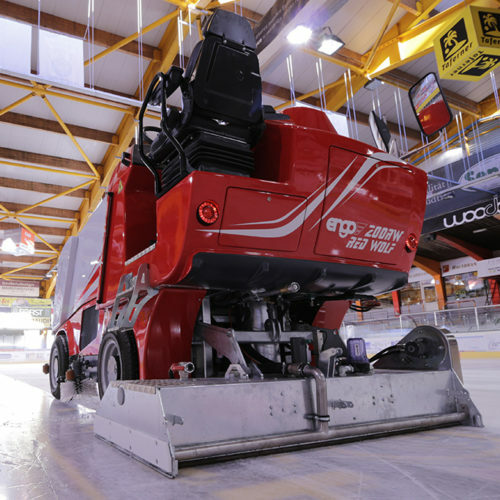 Leveraging an easy to operate and highly efficient machine, such as the Engo Wolf Electric Ice Resurfacer, significantly reduces your facility’s overall operational expenses, emits zero emissions, and produces a safe operating environment. In addition to ice-making and refrigeration, ice maintenance is often an overlooked area of potential energy savings. Outdated equipment may be still functional, so budget constraints can delay new equipment purchases, resulting in possible missed energy savings. When possible, facility managers should build a business case to demonstrate that more modern ice maintenance equipment will pay for itself through operational cost savings as well as reducing the carbon footprint of the facility. For example, gas-powered ice edgers are often suspected to be main contributors to poor air quality in rinks. The Engo Minengo Electric Edger has zero-emissions while effectively removing ice-build up from the rink boards. Not only does it exceed the performance of an ice edger that operates using fossil fuel, it reduces operational costs and facilitates a safe operating environment. There are many factors that contribute to operating an energy efficient arena from mechanical systems to arena equipment to the building architecture. Even small changes can help municipalities uncover savings related to energy conservation and minimize the environmental impact of the facility.